Hi! Lauren Kaye, here, with this week’s Content & Coffee with Brafton. You know great landing pages are crucial for conversions, and by now, you’ve probably also heard that video content has crazy engagement potential. But how exactly do you marry these two ideas on your site? And more importantly, is there proof that it pays off? Click play to watch the video in full, or read more below. Brafton and a client did a little A/B testing to find the answer. 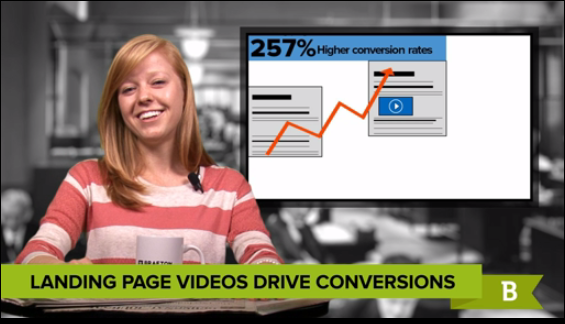 What we discovered is that publishing a video on landing pages can increase conversion rates by 257 percent! To determine the ROI of posting videos on landing pages, we used the Experiment Tool in Google Analytics to create two versions of the same landing page. We added a video to one and left the original with plain text, but otherwise, the pages were identical in every way. Over the course of the two-week experiment, the landing page without a video received 42 visits and generated 3 conversions. This gave the client a conversion rate just above 7 percent. On the other hand, the landing page with the video received over 100 visits and generated 26 conversions. This averages out to a conversion rate over 25 percent, and it means the client’s goal completion rate was 257 percent higher with video. What’s surprising – and even more impressive about the findings – is that the new landing page continued to drive higher conversion rates even as it brought in more traffic. Generally, sites see conversion rates drop when their traffic goes up, simply because a smaller portion of total visitors are converting. The fact that this page experienced significant improvement is a testament to how effective video content is. Given these results, we found the probability of a video-enhanced landing page outperforming a plain text version is 99 percent. The numbers really speak for themselves. We’ve always stood by the argument that well-executed videos can make good content marketing campaigns even better, but it never hurts to have the evidence to back it up. Catch you next week, and happy content marketing!